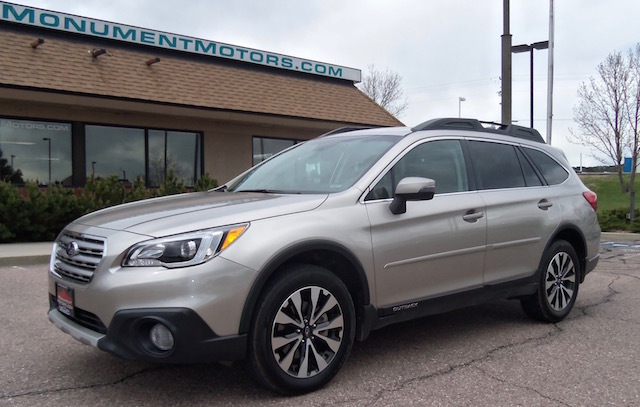 2016 Outback 2.5i Limited Edition with Eyesight System at Monument Motors, your source for used Subaru Outbacks near Colorado Springs, Castle Rock & Denver. Local, two owner Colorado car. * Fully loaded Outback 2.5i Limited Edition with CVT automatic transmission & paddle shifters, EyeSight Driver Assist System (Pre-Collision Braking & Throttle Management, Lane Departure & Sway Warning with Lane Keep Assist, and Adaptive Cruise Control), Blind-Spot Detection with Lane Change Assist & Rear Cross-Traffic Alert, STARLINK voice-activated Multimedia Navigation System, Power Moonroof, Keyless Access with Push-Button Start, Back-Up Camera, Power Tailgate with memory, beige Leather seats, heated front & rear seats, heated mirrors & windshield, VDC stability control, Traction Control, X-MODE & Hill Descent Control, STARLINK system, Bluetooth, premium Harman/Kardon am/fm/satellite/MP3/WMA HD stereo with color LCD touchscreen display & CD player, subwoofer/amplifier, auxiliary jack & dual USB ports, frontal airbags, side-impact & side-curtain airbags, exterior auto-dimming mirrors with approach lighting, 18″ alloy wheels, premium Toyo tires, side body moldings, remote keyless entry, alarm, dual-zone climate control, power seats with memory, rear-seat recline, rear seat back protector, auto-dimming mirror with compass & HomeLink, woodgrain accents, cabin air filtration, rear privacy glass, fog lights, front bumper underguard, signal mirrors, splash guards, rear bumper cover and roof rack with retractable crossbars & tie-downs. This Outback has nearly every possible option. (The original Factory MSRP on this fully loaded Outback Limited was approximately $36,000.) Price includes Balance of Factory Warranty, and this Subaru qualifies for a 5year or +100,000mile Extended Service Plan at an additional cost. JUST SERVICED AND NEW: engine oil & filter, air filter and cabin air filter. The head gaskets & valve cover gaskets are dry, and no oil or coolant leaks. This newer design 2.5liter DOHC boxer engine has a timing chain, so no timing belt to change. *PLEASE CALL FOR VEHICLE HISTORY & DISCOUNTED PRICING. Copyright © 2002-2017 MonumentMotors.com. All rights reserved.